MLB and the NBA Support Legal Sports Betting But Why Now? Major League Baseball and the National Basketball Association have made it known that they are seeking a piece of the action should sports betting eventually be legalized, and the Professional and Amateur Sports Protection Act of 1992 be overruled by the Christie v NCAA Supreme Court case. As the SCOTUS’ decision gets closer and closer, it becomes more and more likely, gauging the reactions of parties involved, that the federal ban on sports betting could be ruled unconstitutional, allowing New Jersey to offer sports betting and potentially opening the U.S. to an untapped sports gambling market. The highly anticipated verdict could be released as early as March 15, so professional sports leagues are scrambling to voice their opinions on proposed legislation meant to legalize and establish sports gambling facilities state-by-state. 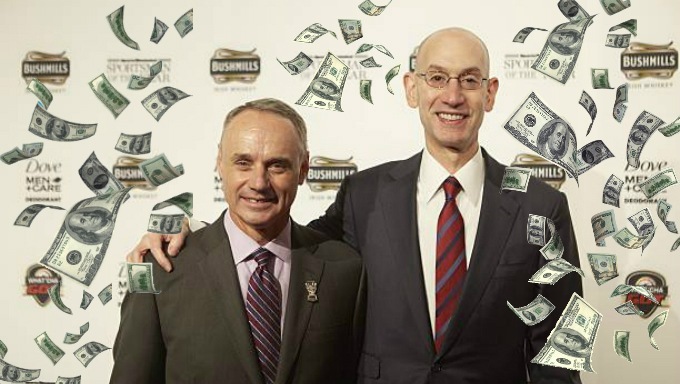 On January 18, MLB and the NBA released a draft of what they call the 'Model Sports Wagering Act' to detail what they anticipate would be “fair” legislation and thus warrant their support. Professional sports leagues may have rights to the intellectual property of their products (athletic events), but they also profit immensely from those products on everything from ticket sales to television deals. Nevada, the only state in which sports betting is fully legal, doesn’t currently pay sports leagues “integrity fees”. MLB and the NBA are treating sports gambling as something it will “allow” when in reality it is something that could very well be established as a state right if the Supreme Court decides to strike down PASPA. Section One of the Act serves as a glossary of terms defining several key subjects that recur throughout it. “Sports governing bodies” (we’ll shorten to SGBs) represent the pro sports leagues (MLB, the NBA, etc. ), while a “sports wagering operator” (operator) would be a state legalized gaming facility that would offer sports betting. A “sports wager” is anything including but not limited to “single-game bets, teaser bets, parlays, over-under, moneyline, pools, exchange wagering, in-game wagering, in-play bets, proposition bets, and straight bets.” A “sports wagering platform” would equate to an online bookmaker, and the “regulating entity” in most cases would mean the state offering or interested in offering gambling. Section Two puts these terms into action first claiming that in order to offer sports wagering a facility must be pursuant to the Act but can offer wagering both in-person and over the internet, via a sportsbook, to consumers physically located in the state. The operator can contract with interactive bookmakers to distribute wagering on behalf of the platform. Section Three states that a platform must have a license provided by the state and applicants must pay an initial fee of $10,000 followed by an annual $5,000 renewal fee. The application will be verified by standards under the Act by the state. Section Four begins dictating responsibilities to the state and operators stating that the latter must verify that participants are minimum legal age to bet and allow individuals to restrict placing wagers with the operator. Then it outlines guidelines for responsible advertising practices such as not directing advertisements at minors, assuring the disclosure of the identity of the operator in advertisements and providing links to help with gambling addiction. (5) maintain the security of wagering data, customer data, and other confidential information from unauthorized access and dissemination; provided, however, that nothing in this Act shall preclude the use of internet or cloud-based hosting of such data and information or disclosure as required by court order, other law, or this Act. Aside from that, the SGB may notify the state that it wants to limit, restrict or exclude wagering on events if providing notice to in the form or manner dictated by the state. Limitations include the power to restrict sources of data and associated video an operator can use to offer and pay wagers and bet types offered. If an operator offers of takes wagers contrary to restrictions imposed by a SGB that must be thus published by the State, the operator will violate the act. It’s only after listing all of these expectations on the part of the state and the operators in terms of maintaining integrity, that the proposition nudges its request for a fee in Section Six amongst guidelines for recordkeeping. 3. At least once per calendar quarter, a sports wagering operator shall remit to the relevant sports governing body a sport betting right and integrity fee of one percent of the amount wagered on its sporting events. Sections Eight, Nine and Ten go on to lay out the penalties for violating the Act, criminal liabilities and the overarching statement that it first must be decided within the state that federal law will allow the practice of sports betting. What is so confounding about the insistence of the leagues to protect the integrity of their sports outcomes in light of the proposed Act, is the amount of uncompensated responsibility they leave in the hands of the states and would-be operators. What’s worse is, the SGBs not only delegate responsibilities that they, themselves, would be in some cases better suited to handle due their resources to the states, but also do it without any promise of financial assistance. While it sounds good on the part of the leagues to champion their concern for maintaining security and integrity by creating fees as some sort of perceived "check" on facilities, the bill doesn’t express the cost of carrying out such security that would be incurred and how it would relate to any potential profits. Where, if they actually genuinely cared about the integrity fo their given sports, SGBs might've offered to foot some of the bill for the enforcement of that integrity, they instead decided to levy their unjustifiable one percent fee, revealing their true interests to profit above all on the backs of the state officials and operators. So, as can be inferred by this proposed bill, arrogantly portrayed as the “model example” for legislation, MLB and the NBA essentially act as bullies intent on taking what may become a right of the states and turning it into a privilege that can only be doled out in compliance to the demands of multi-billion dollar sports entities. While some state legislation has already conceded to these demands, some states like West Virginia have had no issue passing proposed bills that don't match this model. More and more states are drafting their own bills, and if/when the clock strikes midnight on PASPA the U.S. will find out how much the opinions of SGBs truly matter. As of now, it's all conjecture, but if the starting point is a stance of inflicting unprecedented fees, there may be some ways to go in terms of negotiating a truly fair break for those who wish to push the United States forward into the sports betting business that's so prevalent elsewhere around the world.